Hi friends! 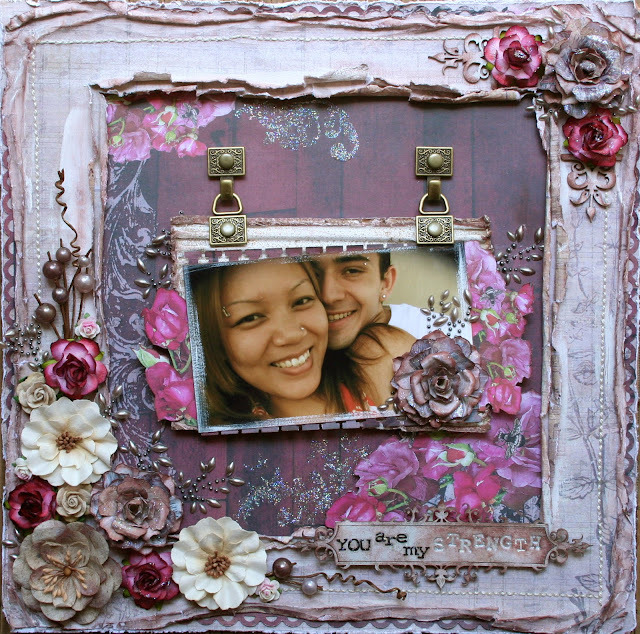 This is another layout I created for Donna Salazar Designs using her GORGEOUS Antiquities Collection. I am in loooove with these papers! I dedicated this layout to my hubby because, as the title says, he is my strength. Before I met him I had a difficult life. I was a single mom, working full time and taking care of my two babies at the same time. (They literally came to work with me every day.) There were many difficulties in my life at the time that caused me to feel truly unhappy. One day while on a family vacation in South America, I met my (now) husband and there was an instant connection. Five months later we were engaged, and a year after that we were married! I know it may sound like a fairytale, but believe me, it wasn't always easy. We had to endure a long-distance relationship for quite some time. But looking back, I think the distance made our relationship stronger. My husband has stood by me through the many challenges I have had to face, and because of him, I am a stronger person today. I am truly happy now. I created somewhat of a distressed 'frame' for my layout using Donna's 'Let's Ride' and 'Theater' papers. I hand-stitched a border around the frame and inked the edges using Colorbox Cat's Eye Pigment Ink in Chestnut. The edges of my layout were distressed with a Zutter Distrezz-It-All. The beautiful vintage nameplate (DA0463) is a chipboard element made by The Dusty Attic. It was inked using Chestnut Pigment Ink and spritzed with Vanilla Shimmer Smooch Spritz. The word 'STRENGTH' was debossed using a Chip Art tool and Sparrow Alphabet set by Melody Ross. The photo of my husband and I is layered on top of Corrugated Board by Zutter. The corrugated board was painted with white acrylic paint and spritzed with Caramel Latte Smooch Spritz. I fussy cut some of the beautiful floral images from the Queen Bees paper and layered them beneath my photo. This flower is hand-made using a variety of different papers from the Antiquities collection. I applied a coat of Glue Gloss and Fairy Dust Glitter on each flower to add a little shimmer. For a tutorial on how to make these flowers, click here. This cluster of flowers is made up of Prima, mulberry and hand-made flowers. I also added some pearls and vines made by Prima as well. To the right of the floral cluster you can catch a glimpse of a shimmery design. This was made using Clearsnap's Design Adhesives. It is a double-sided patterned adhesive that can be used with glitter, embossing powder, micro beads and much more! You simply peel and stick the adhesive and coat it with whatever you like. It creates such a beautiful effect! Much of this layout was brushed with white acrylic paint. I really love the 'whitewashed' look because it adds a shabby feel to any project. The photo flips up to reveal hidden journaling! This quote was written by Lao Tzu, an ancient Chinese philosopher. I believe strongly in the truth of this quote and found it to be very fitting for this layout. Each line was printed onto cardstock and spritzed with Smooch Spritz. Each journaling strip was hand-stitched for added texture. 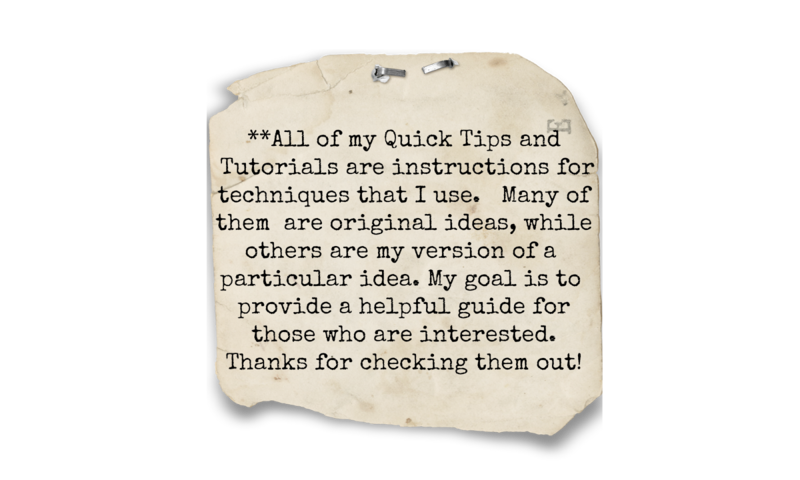 Thank you for stopping by to take a peek at my layout. I hope you all have a beautiful and creative day! WOW, this Layout is stunning. I absolutely love everything about it. Thanks so much for all of the inspiration you provide, your work is stunning!!! Hi Natasha, I haven't dropped in to say hi for a very long time but I still check out your fabulous pages. I am always in awe of the level of detail you include in your pages. This is another gorgeous gorgeous page. Sounds like you found a very special man indeed!! Hi! I was busy lately so I`m happy I can visit you again! Great photo, sweet design! Hugs! Well Natasha....you have done it once again!! I love every one of your beautiful details! Wow is all I can say! Natasha, thank you for sharing such a beautiful story of you and your husband and what strength and love he has brought to your life. I always look forward to your postings and what love you put into each page! My favorite thing is always the hand stitching! How cool are those photo hangers??? with the hidden journaling ! Mad skillz you have girlie!! You always have me wanting more N! Absolutely gorgeous Natasha! Love the layout, the whitewashing and your flowers! Also love the hanging pic with hidden journaling. I think this is the first eyelet free layout I've seen from you! LOL Very Pretty! Loving every detail of this beautiful l/o! the whitewash effect is really striking. I can't stop looking at this AMAZING layout - the lovely photo, and touching story behind it makes everything even more beautiful! You ROCKED it again my friend!! - Now why am I stuck at work when I want to be home playing!!??? Thanks for sharing and as always, thanks for the inspiration! I like the hangers, the corners, the distressed borders and of course the photo! I am in AWE, Natasha....mouth hanging open, not only from your layout, but your love story, AND all the details you explained in the gorgeous clear crisp photos! I am taking notes, my dear, on how to do a blog RIGHT! :) Incredible!!! Absolutely gorgeous!! You know I've always loved the story on how you met the hubby. In addition, the overall design of this page...all your attention to details & the hidden journaling are simply amazing as usual! I especially liked the chip art tool! I didn't know of such a thing & I've been wanting something like that...am looking for one right now online! :-) Cause I simply don't have enough scrapbook supplies! OMG Natasha, you're layout is amazing. The amount of texture and depth you created is wonderful. 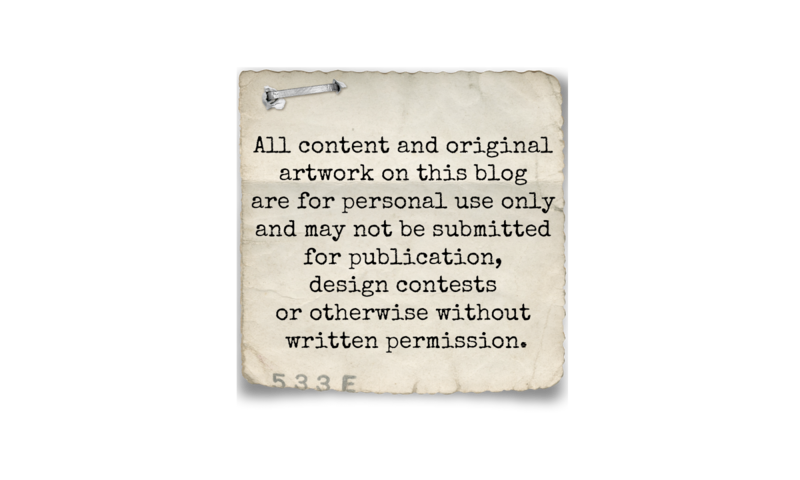 I came across your Antiquites Box on Donna's blog and I'm now an avid follower of yours. Can't wait to see what you make next! these are gorgeous flowers! I'm gonna give them a try! thanks! Natasha I'm very happy for you! You deserve to be happy! You are a very talented and pretty lady and I wish you luck and happiness in your life! Your every layout is the eye candy! Your work is always so inspiring!